BACK BY POPULAR DEMAND - Critically Acclaimed Jazz Vocalist Libby York Returns to Cuvée Ray Wine Bar & Restaurant in Rehoboth Beach for an Intimate Evening of Standards. 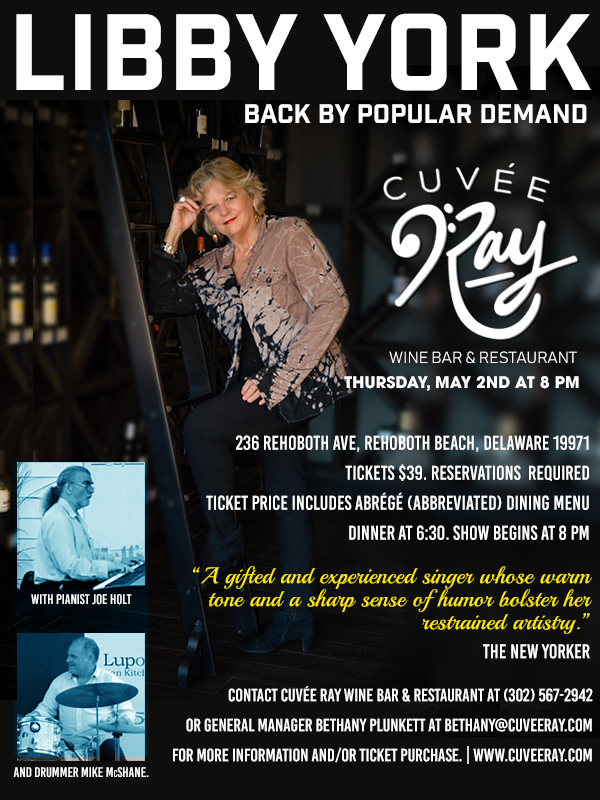 Cuvée Ray Wine Bar & Restaurant, located at 236 Rehoboth Avenue in Rehoboth Beach, Delaware, is proud to announce the return of internationally celebrated jazz vocalist Libby York for an intimate evening of performance on Thursday, May 2 beginning at 8 PM. Described by The New Yorker as “a gifted and experienced singer whose warm tone and a sharp sense of humor bolster her restrained artistry” and “a jazz singer of cool composure and artful subtly” by the New York Times, York is now beginning her fourth decade in the business and she has no plans to slow down. In fact, her celebratory schedule includes upcoming shows in New York City, California and her hometown of Chicago. While Libby York has made New York her home for many years, she has strong connections to Rehoboth Beach. York was one of the original co-founders of the acclaimed Back Porch Cafe, along with Ted Fisher and Victor Pisapia. The three entrepreneurs were named some of the “50 Most Influential Delawareans of the Past 50 Years" by Delaware Today Magazine for starting the fine dining movement in Coastal Delaware. As York says, "Coming back to Rehoboth is like coming home." Cuvée Ray Wine Bar & Restaurant owner Ray Kurz is understandably thrilled about York’s reappearance at the popular eatery known for their fine wine, fine dining and exceptional live entertainment. “When Libby first performed here last October, the audience was blown away! She’s a consummate performer with an amazing history and knowledge of her craft which is naturally reflected perfectly in her voice and delivery,” he said. Ray added that Libby’s performance was the perfect way to kick-off a live entertainment based, Thursday night, monthly series called “Cuvée Ray Presents” which will feature a wide-variety of performers highlighted with selected specialty menu items and drink. Rejoining York during her performance at Cuvée Ray Wine Bar & Restaurant will be pianist Joe Holt and drummer Mike McShane. Tickets to this performance cost $39 and reservations are required. Included in the ticket price is an exceptionally prepared abrégé (abbreviated) dining menu which will be served between 6:30 and 8 PM with dessert served at a 9 PM intermission. Seating is limited for this special event and patrons are advised to purchase tickets at their earliest convenience as Libby York’s previous performance at Cuvée Ray Wine Bar & Restaurant was a sold-out event. Contact Cuvée Ray Wine Bar & Restaurant at (302) 567-2942 or General Manager Bethany Plunkett at bethany@cuveeray.com for more information and/or ticket purchase. 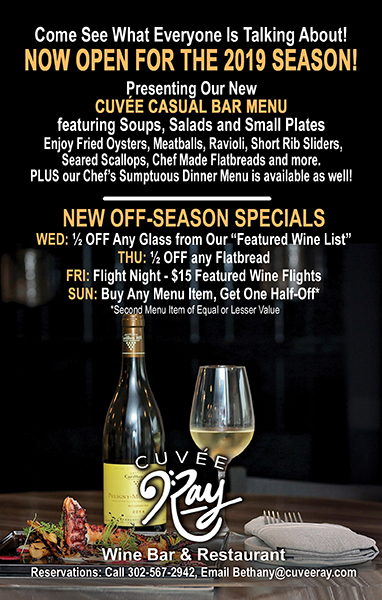 More about Cuvée Ray Wine Bar & Restaurant online at www.CuveeRay.com. Listen to Ray Kurz’s ( AKA Cuvée Ray) weekly update every Saturday morning at 11 on Coastal A&E With Host Michael Sprouse! 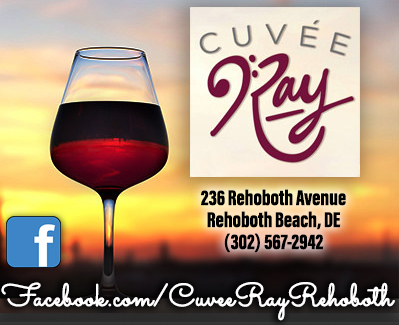 Cuvée Ray is a proud sponsor of Coastal A&E On Delaware 105.9 FM!